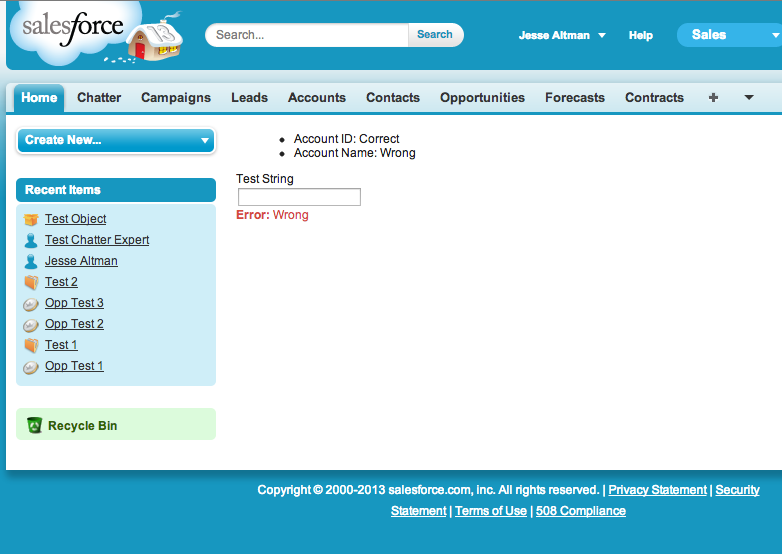 Home Salesforce Developer Difference between the multiple messaging options in Visualforce? I have always been curious what are the exact differences between all of the messaging options Visualforce provides, such as <apex:message>, <apex:messages>, <apex:pageMessage>, and <apex:pageMessages>. The description the Salesforce documentation provides can be rather cryptic. A message for a specific component, such as a warning or error. If an or component is not included in a page, most warning and error messages are only shown in the debug log. All messages that were generated for all components on the current page. If an or component is not included in a page, most warning and error messages are only shown in the debug log. This component should be used for presenting custom messages in the page using the Salesforce pattern for errors, warnings and other types of messages for a given severity. See also the pageMessages component. This component displays all messages that were generated for all components on the current page, presented using the Salesforce styling. So, most of that sounds relatively similar. What are the differences and what are the use cases for each? Let me start off by explaining each of these in more detail. This can be used to display any custom message that you always want to appear on the screen. There may be a case that whenever a user is on a form you may want a warning to appear to display important information to them. 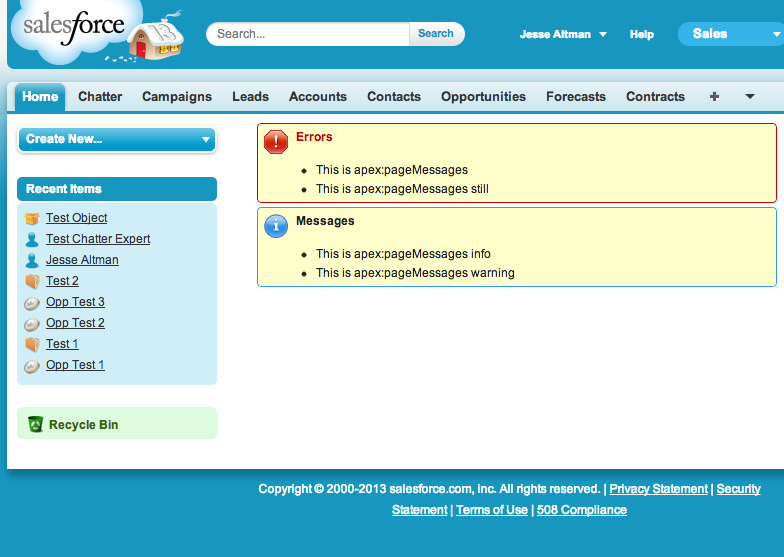 Notice how that single instance of the <apex:pageMessages> handles all of the errors on the page. The use case for this object is to capture all errors on the page. It should be used on most custom Visualforce page as a catch all to let users know what errors occur (if no other messaging is used). 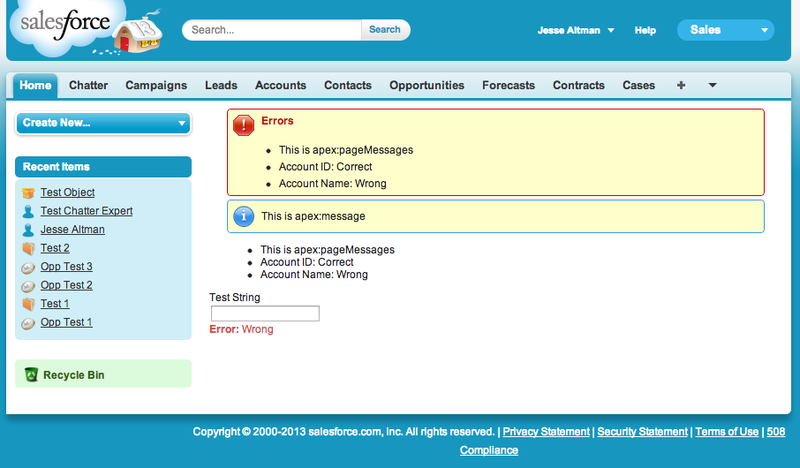 Notice how only the Name error is shown because that is the only field that has an <apex:message> associated to it. Also notice that although this does have some styling, the styling is minimalistic and Salesforce expects the developer to handle the styling as necessary in this situation. This provides no formatting for the errors, however, it does display them all. 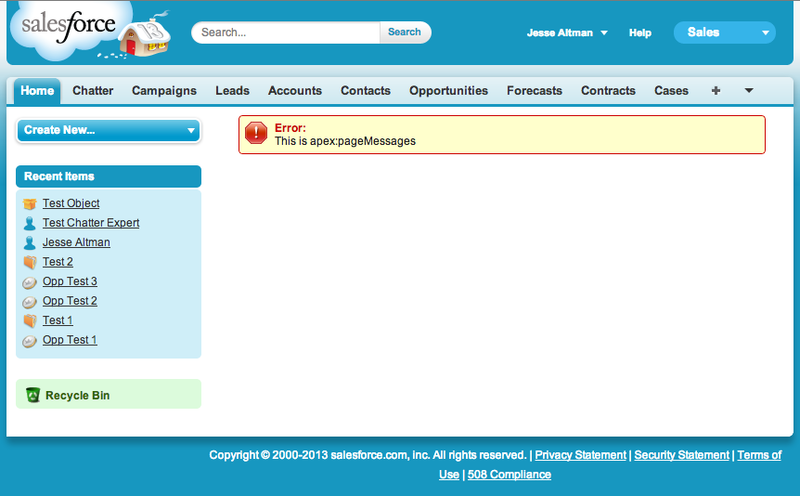 The use case for using <apex:messages> is to display all errors on the page while providing your own styling. As expected, <apex:pageMessages> shows all of the errors with formatting, <apex:pageMessage> only shows the specified message, <apex:messages> shows all of the errors with no formatting, and <apex:message> shows only the error for the specified field. I’m glad you enjoyed it enough to comment! This was a topic that always interested me, so I really enjoyed writing this article. It is really a very good article on visual force messaging. Can you also provide us with the limitations of apex/visual force page messaging. I don’t believe there are limits when working with this type of messaging Mayank. At least, none that I am really aware of. It is just adding messages to the Visualforce page, so it shouldn’t add extra processing that Salesforce would be concerned with. Great article, this is one area often considered after the fact in development yet Clear concise messages, error or warning really go a long way in making software user FRIENDLY!!!!! I am glad you enjoyed it Larry. I agree, it is crucial to user experience to be able to easily tell them what is going on with the system. Using these methods allow you to do exactly that. Thanks for the Nice Article. 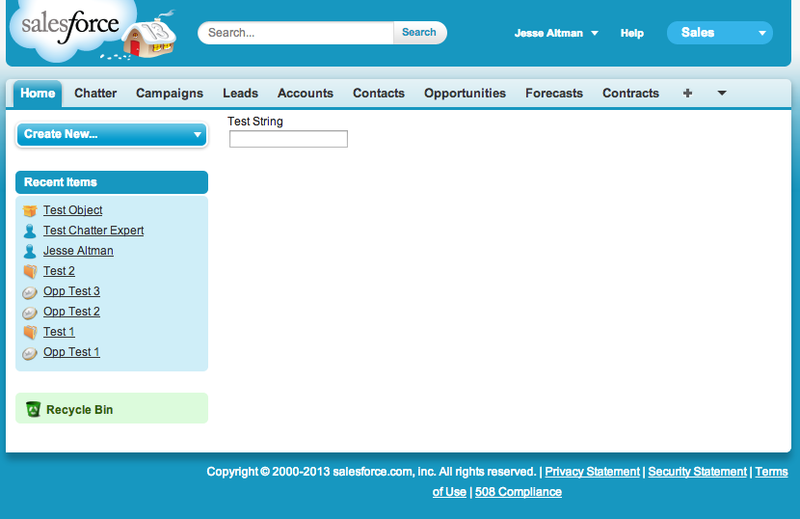 I was reading salesforce help and was puzzled with the message behavior. This article corrected my all understanding about apex message. Hi , I felt so happy after reading this article . I always wondered about different types of messages in sales force. Now I am crystal clear. Continue sharing your knowledge. I am really glad you enjoyed it! Keep checking every Monday morning at 6:45am EST for new articles! Its a good article. Thank you for sharing. Some of my doubts got clear & also learned some different ways to display messages on page, like for a particular field and collectively as well. Very nice article . It clears all the confusions . Nice and very clear article, thank you!! This is very informative, concise and crisp. Thanks, this helps. One question I haven’t found answered yet. I’m using field level Add.Error for specific errors, but I also have apex:pageMessages to capture remaining. So in your example, the “Wrong” error would also show up under the inputfield but NOT in the pagesMessages. Is that possible? very good description thank you!